We tend to think of cars as a mature technology. They’re good enough to be boring. But something weird is happening. Silicon Valley is eyeing the car business. First it was Tesla, Google—even Uber. Now, it’s Apple. According to Bloomberg, Apple has a team of 200 secretly working on a car. They’ve evidently been luring talent away from Tesla with lucrative bonuses and comp. And battery-maker A123 Systems filed a lawsuit against Apple for poaching its employees. The rumor? Apple’s aiming to develop an electric car by 2020. It sounds bizarre—but it might not be that crazy. Cars have historically been all about the hardware. Complicated machines requiring complicated industrial processes. Getting into the industry takes a huge investment, and even wildly successful doesn’t equal wildly profitable. Tesla was America’s first profitable new automaker since Chrysler was founded. So, why would Apple, a personal computing icon and one of the most profitable firms ever, wade into the car industry on the side? Because as the traditional hardware gets simpler and cheaper to build, the value will be in the brains—the chips, sensors, and software—just like it is in computers today. “What you’re dealing with here is simply a new class of device, and it just happens to look like a car,” says Paul Saffo, futurist and Chair of Futures Studies and Forecasting at Singularity University. That may explain why Apple and others are interested in cars. But the traditional line also still holds true: It is very difficult to get into the car business from the ground up and make money at it. Even Tesla has been at it for over a decade. And they’ve benefitted from direct and indirect government support of electric cars. This is an argument for Silicon Valley to partner with the old guard—supply the software to firms that already have the necessary infrastructure and processes in place. Or Apple could go out and buy a car company or a factory for the infrastructure and experience with their $178 billion in cash. Whatever they do, to make the rumored 2020 deadline, they’ll have to hustle. 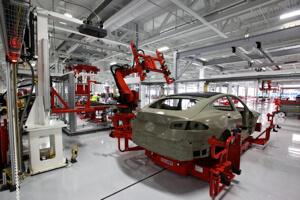 And that means they’ll grapple with how cars have been made traditionally by hiring, outsourcing, and collaborating. But in the longer run, all the traditional stuff about how hard and unprofitable it is to make cars: What if all that changed? Advanced robotics, 3D printing, and other computer-assisted industrial methods are threatening to upend how we produce big industrial machines. Modern cars are a mess of parts. That may change—lowering today’s formidable barriers to entry. Local Motors, for example, wants to 3D print cars. Their goal is to reduce a car’s thousands of parts to 20. 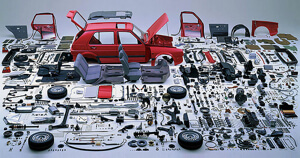 Most car companies source these parts from a menagerie of suppliers. Imagine how much easier it would be if most of these (far fewer) parts were made in-house. While we can’t 3D print everything yet, industrial 3D printers are getting better, faster, and more capable. SpaceX is using 3D printed parts in rocket engines, the first of which, a rocket engine oxidizer valve, flew last year. GE, meanwhile, will include 3D printed nozzles in their next-generation CFM Leap jet engine (due in 2016). Each new GE nozzle consolidates 18 parts into one, and it’s lighter to boot. If 3D printing works in rocket and jet engines, it can make a splash in cars too. And 3D printing also increases design freedom—Jonny Ive would like that—and already speeds up prototyping. There’s also another simplifying force at play. Electric cars replace the beautiful nightmare of pistons and injectors in today’s combustion engines with an electric motor. Again, many moving parts to just one. Add it all up, what do you get? A simplified metal case, a battery, sensors, and a bunch of microchips. A car is bigger, but what if making one was little harder than making a smartphone or computer—just different? We don’t know if Apple will make a car. All we’ve got is a fairly solid rumor that they’re dipping their toes in. They could end the experiment at any time, throw it in reverse, and leave cars to Detroit. But the fact that Apple and others are considering making cars at all is indicative of the larger trend. As hardware gets simpler and software more complex, exactly what we consider a computing device is likely to evolve and diversify in the coming years—and the tech industry will go along for the ride.